MOSCOW, Russia -- Russia declared an end Thursday to its 10-year anti-terror "operation" in the autonomous republic of Chechnya. 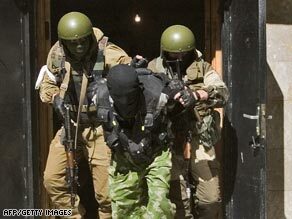 Russian forces have been operating in Chechnya since Boris Yeltsin's order in 1999. The end to the offensive could see the withdrawal of thousands of troops from the Muslim-majority region, where Russia has fought two wars since the collapse of the Soviet Union in December 1991. The head of the Federal Security Service "canceled the decree declaring a counterterrorist operation in the territory of the republic as of midnight of April 16," Russia's anti-terror committee said. It said it did so to create "the conditions for the future normalization of the situation in the republic, its reconstruction and development of its socio-economic sphere," it said in a statement. The late president Boris Yeltsin ordered the counter-terrorist operation in 1999. Since then, the region has been relatively stable.